Hello everyone. It's Tuesday and time for another challenge at Die-Cuttin Divas. Our challenge this week is "Anything Goes". Just remember to add a die-cut. I wanted to do something quick and classy so I decided to work with my Spellbinders Lacy Ovals and Outline Stickers from Classy Cards N Such online store. This beautiful shimmery cardstock is called Stardream Ruby but is in fact a gorgeous shade of purple. My lacy ovals were also cut out of a gorgeous shimmer cardstock called Champagne Reich Shine. The birdhouses are outline stickers that can be colored in or left blank. My flowers are from Prima and they are called Sugar Blooms. Everything I used on my card today is available at Classy Cards N Such and you can take 10% off your order with my discount code: JENNIPHER-10. Now you must stop by the Die Cuttin Divas to see what my fellow Divas created and to play along in the challenge. Beautiful card! That purple is so rich! Very cute Jennipher...love those flowers! TFS!!! What a sweet card. I love the placement by threes and the color choices are wonderful. Beautiful!! The flowers, the paper, the images!!! So many pretty things to love on this! 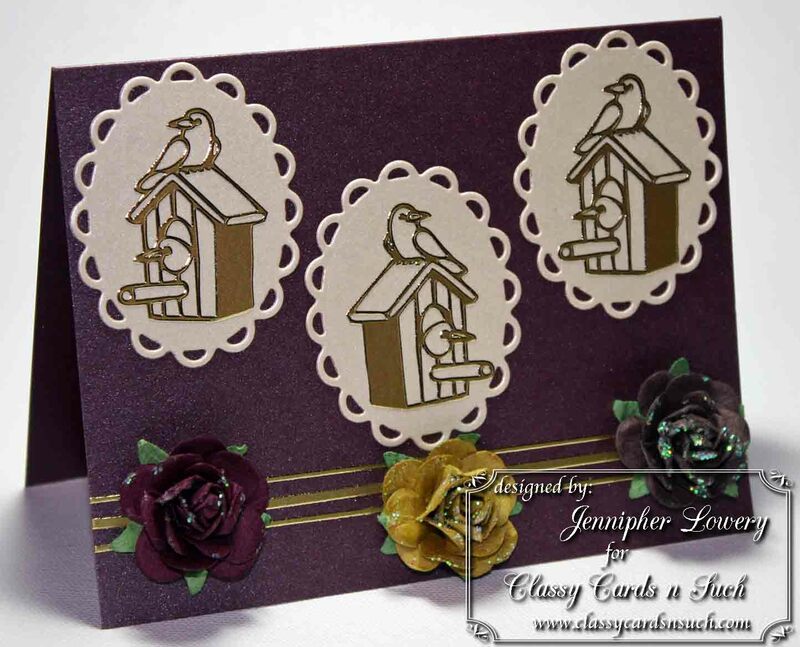 Pretty card, and I love all that shimmery card stock! yum!